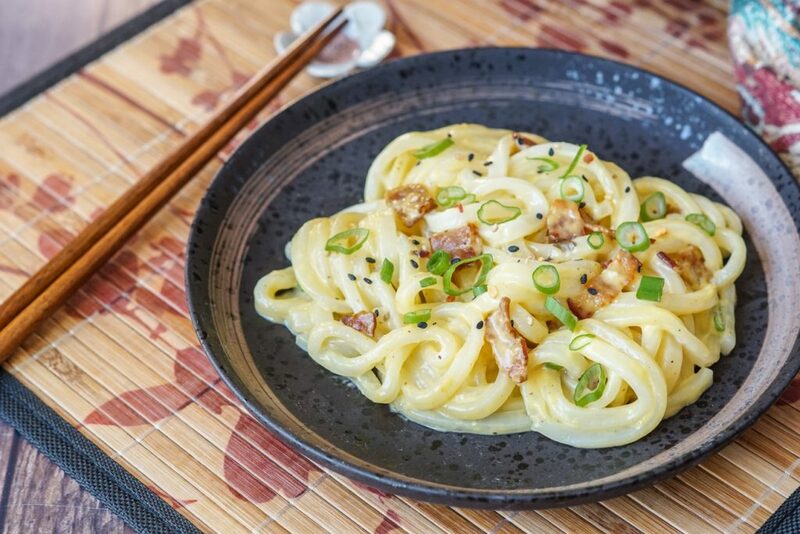 Overview of Little Tokyo in Los Angeles and a recipe for Miso Carbonara Udon- thick udon noodles coated in a creamy miso sauce with cheese and bacon. Little Tokyo (小東京) in downtown Los Angeles is one of only three historically Japanese districts in the United States (the other two are also in California- one in San Francisco and the other in San Jose). Roughly the size of 5 city blocks, it is bordered by 1st Street to the north, 3rd Street to the south, Los Angeles Street to the west, and Alameda Street to the east. The population in Little Tokyo grew from 3,500 in 1905 to around 30,000 by its peak in 1941. With the forced incarceration of immigrants and American citizens with Japanese ancestry following the signing of Executive Order 9066, the area emptied and briefly transformed into Bronzeville. After their release at the end of the war, many of the previous residents moved to nearby neighborhoods due to lack of housing and space. The district has continued to rebuild amid threats of development and was declared a National Historic Landmark District in 1995. The Home is Little Tokyo mural in the photo above is located across the street from the Japanese American National Museum on the southwest corner of E 1st Street and S Central Avenue. It was created by Tony Osumi, Sergio Diaz, and Jorge Diaz with help from hundreds of community members. 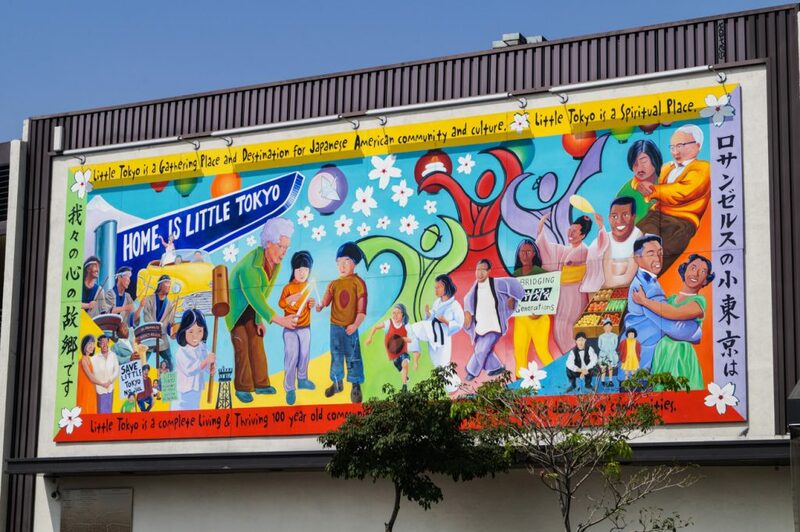 The 16-by-40-foot mural was completed in 2005 and is filled with images from Little Tokyo’s history. 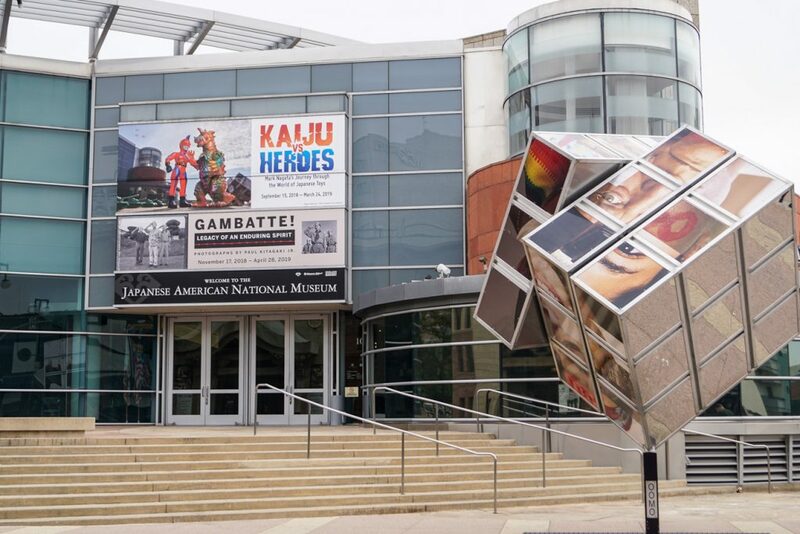 Founded in 1992 and moved to its current building in January 1999, the Japanese American National Museum is located at 100 North Central Avenue in Little Tokyo. 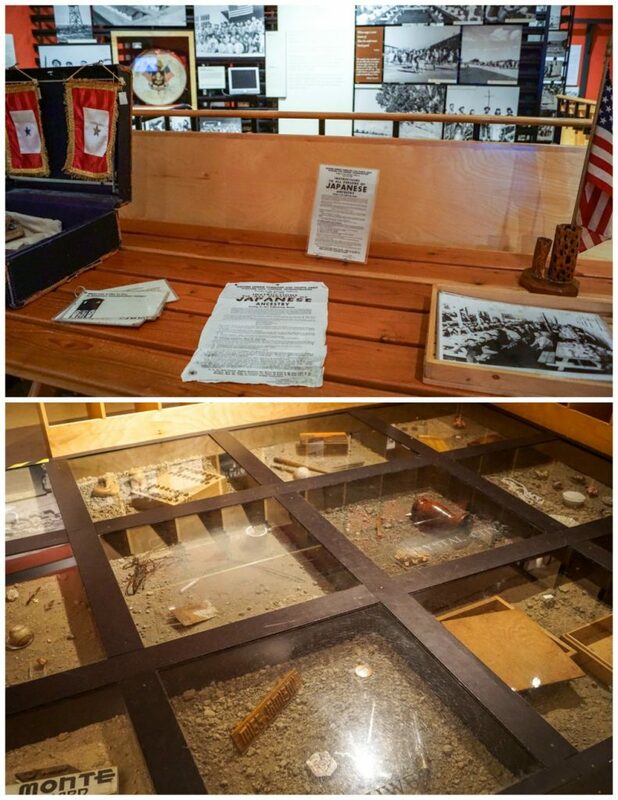 This museum focuses on the 130 years of Japanese-American history in the United States from the first waves of immigration to the internment camps and aftermath following the end of World War II. Current exhibits include Kaiju vs Heroes: Mark Nagata’s Journey through the World of Japanese Toys, Gambatte! Legacy of an Enduring Spirit, Sadako’s Crane, and Common Ground: The Heart of Community. Admission at the time of this post (2019) is $12 for adults, $6 for seniors and youth, and free for children 5 and under. Allow 90 minutes to 2 hours to see the exhibits. Special events are held throughout the year. 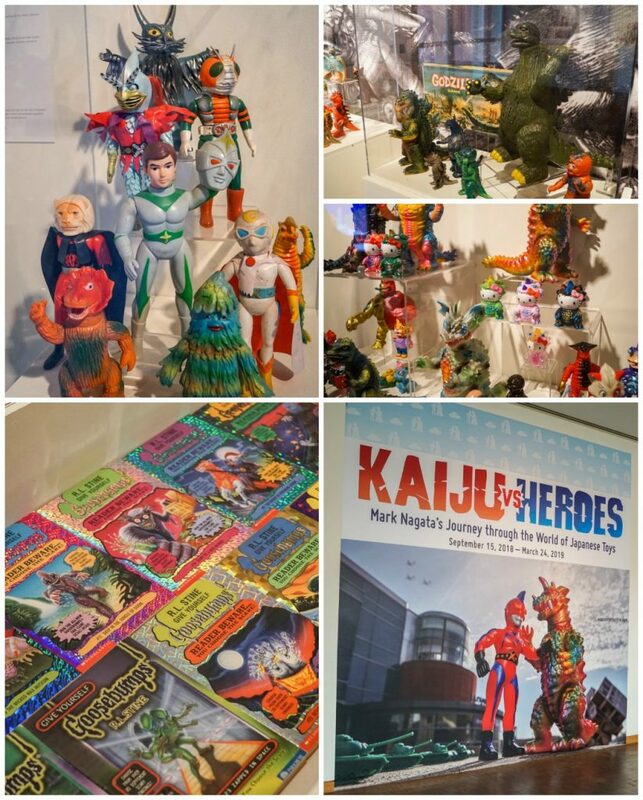 Kaiju vs Heroes: Mark Nagata’s Journey through the World of Japanese Toys is a temporary exhibition running from September 15th, 2018 to March 24, 2019. The toy industry in Japan was one of the first to reinvent itself and helped boost the economy during the early postwar reconstruction period. At the age of 9 in 1973, Mark Nagata was sent a box of kaiju (strange creature or monster) and hero Japanese toys with art-laden packaging from his aunt and uncle stationed on a US military base in Japan. This began his path to becoming a toy designer, toy collector, and illustrator (particularly known for his work with Goosebumps). The exhibit features hundreds of vintage and contemporary Japanese vinyl toys on display along with his creations such as Drazoran and Captain Maxx, artwork, and history. 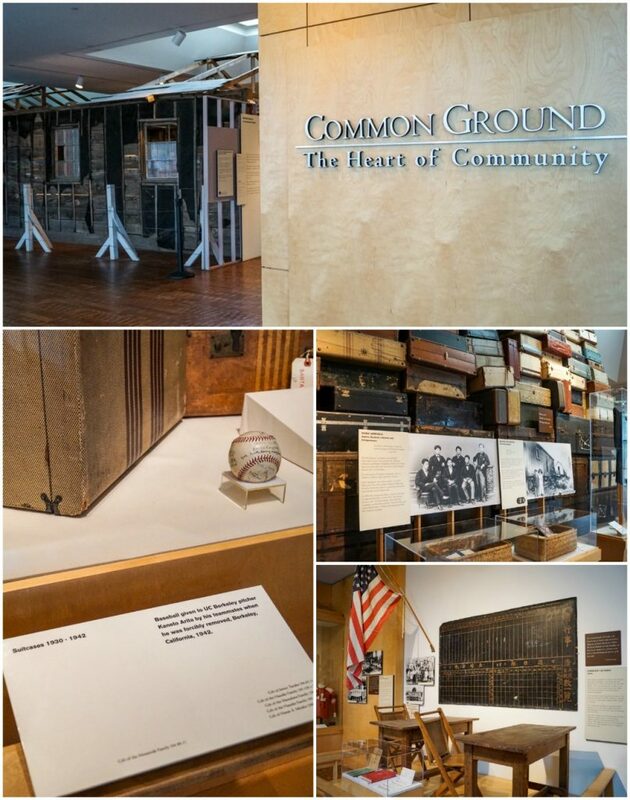 Common Ground: The Heart of Community highlights Japanese-American history beginning with the original Issei (first generation immigrants), their new lives in America, and how they were treated. The exhibit continues to explain the events leading up to the signing of Executive Order 9066 by Franklin D. Roosevelt and the incarceration of 120,000 Japanese-Americans along with the aftermath of rebuilding their lives following their release. Over 2,260 Japanese-Latin Americans were also sent to the internment camps from 13 countries (80% from Peru). Most weren’t allowed to return back to Latin America and were deported to Japan at the end the war (and often had never been to Japan and had no ties to the country). Hundreds of objects, documents, photographs, and notable artifacts (including a Heart Mountain barracks and pages of the original Civil Liberties Act document with Reagan’s signature- on loan from the National Archives) are on display. Audio guides in English, Japanese, Korean, Mandarin, and Spanish are available for this exhibit at the front desk of the museum. Gambatte! Legacy of an Enduring Spirit is a temporary exhibit on display from November 17th, 2018 to April 28th, 2019. 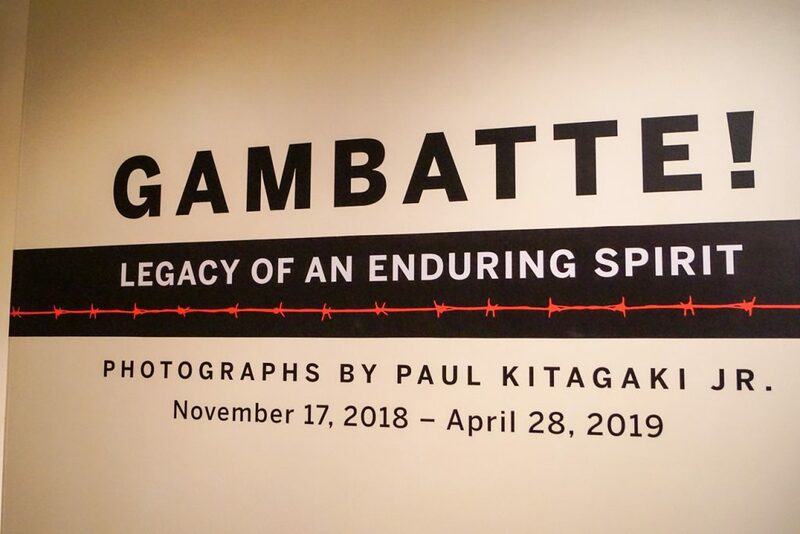 Translating to triumph over adversity, Gambatte highlights the stories of Japanese-Americans forcibly incarcerated during World War II with pairings of modern photographs by Pulitzer Prize-winning photojournalist Paul Kitagaki Jr. next to 75 yr old historical photographs of the same individuals or family members by Dorothea Lange, Ansel Adams, and others. 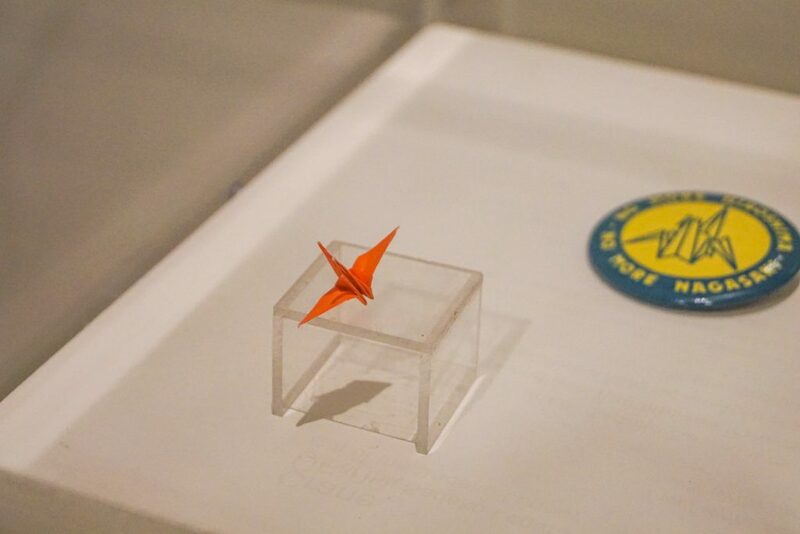 Sadako’s Crane is an ongoing special display at the Japanese American National Museum. Sadako Sasaki was two years old when the atomic bomb dropped on Hiroshima. She was diagnosed with leukemia at the age of 12. A fellow patient told her of the Japanese belief that anyone who folds one thousand cranes would be granted a wish. She folded 1,300 cranes in hopes of recovering, but unfortunately died on October 25, 1955. 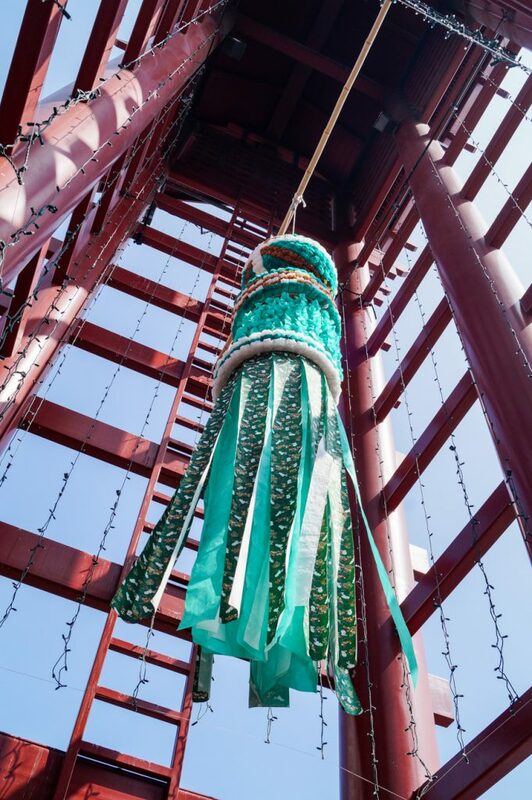 The crane in the photo above was donated to the JANM on May 29, 2016 by members of her family. Other organizations with her original cranes include the Hiroshima Peace Memorial Museum, 9/11 Tribute Center, USS Arizona Memorial, Harry S. Truman Library and Museum, and Austrian Study Centre for Peace and Conflict Resolution. The Children’s Peace Monument was built in Sadako’s honor at the Hiroshima Peace Memorial Park in 1958 and is always surrounded by origami cranes sent in from around the world. Upcoming exhibits for the JANM include At First Light: The Dawning of Asian Pacific America from May 25- October 20, 2019. By the parking lot just behind the Japanese American National Museum is the Go for Broke Monument. 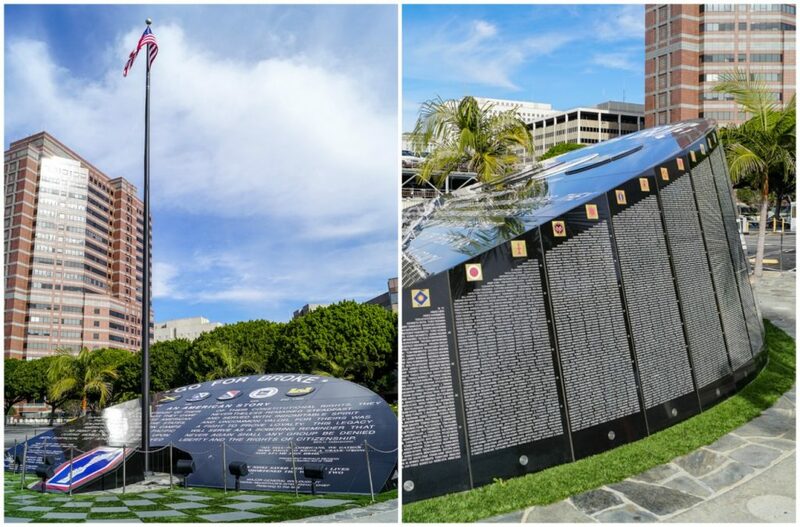 Dedicated on June 5, 1999, this monument honors the Japanese-Americans who served in the United States Army during World War II and remained unrecognized by the government. The side of the black granite monument holds the names of 16,131 Japanese-American men and women who served in the 100th Infantry Battalion (Separate), 442nd Regimental Combat Team, Military Intelligence Service, 522nd Field Artillery Battalion, 232nd Combat Engineer Company, and 1399 Engineer Construction Battalion. Learn more about the monument’s design here. Want to find a specific name? The Go for Broke National Education Center has a database available for locating the name of a veteran who may be listed. 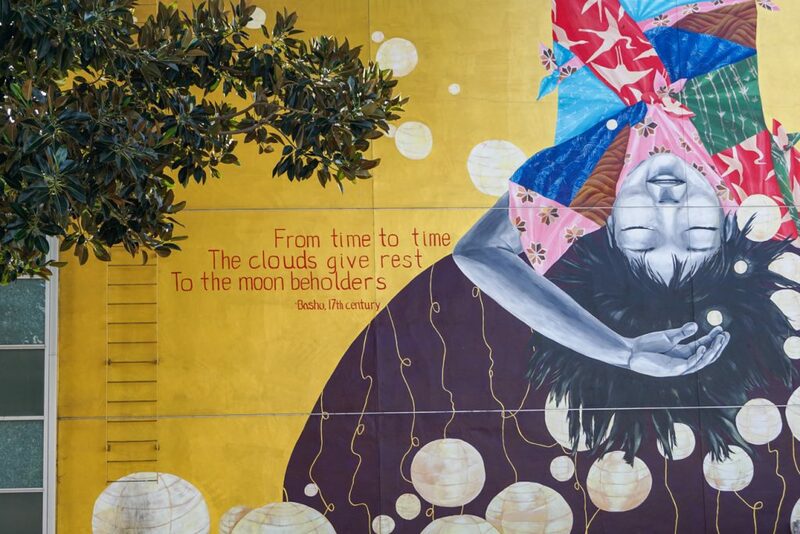 Katie Yamasaki’s Moon Beholders mural was unveiled to the public on November 19th, 2014 following the end of an 11 year ban of murals in Los Angeles in August 2013. It is located on the north wall of the museum’s National Center for the Preservation of Democracy near the Go for Broke Monument. Yamasaki has painted over 60 murals around the world, but this was her first in Los Angeles. 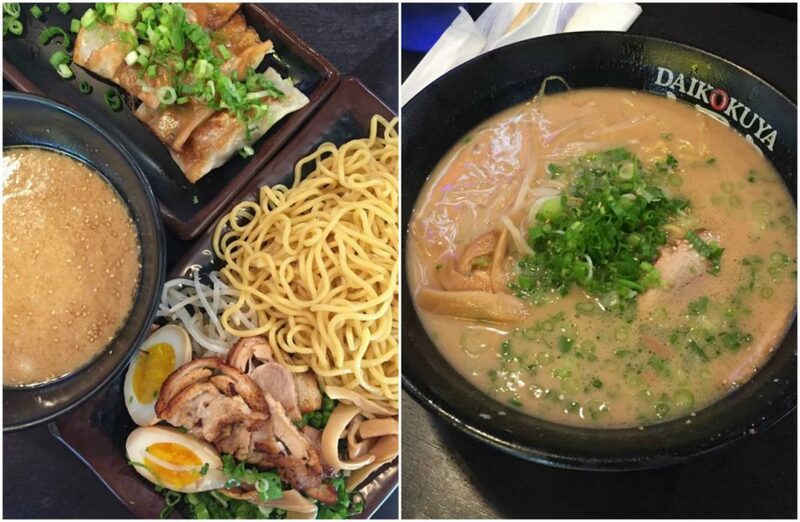 Located at 327 E 1st Street, Daikokuya Ramen is one of the most popular restaurants in Little Tokyo. We visited on a very hot August day, so I opted for the Tsukemen- chilled noodles with seared chashu, egg, bean sprouts, bamboo shoots, green onions, and a pork broth dipping sauce on the side. It was such a refreshing meal to help beat the heat. The restaurant is small and during peak hours the wait can be up to an hour (outside). It is cash only and does not take to-go orders. 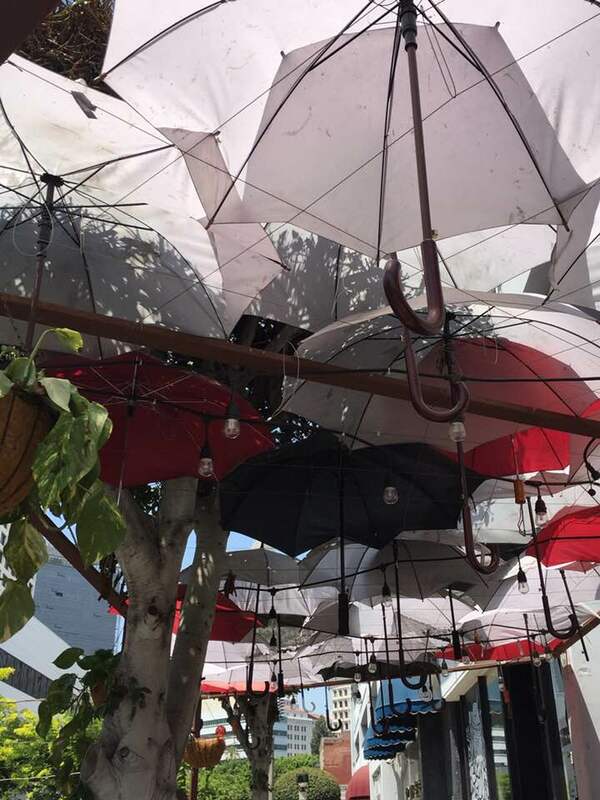 There are also currently locations in El Monte, West Hollywood, Sawtelle, and Monterey Park. Next door to Daikokuya is Marugame Monzo. Like Daikokuya, this space is also small and intimate with often long waits. I arrived around 10 minutes before opening on a Sunday and joined the already forming line. I got the second to last table with a perfect view of the udon station in the glass-walled kitchen. The handmade traditional sanuki udon is a noodle lover’s dream. I tried the Miso Carbonara Udon (味噌カルボナーラうどん) and it is definitely in the top 10 noodle dishes I have ever tried, so much so that I immediately wanted to remake it at home (recipe at the end of the post). Other signature dishes include the Mentai Squid Butter Udon, Udon Gratin (also on my list), Mushroom Cream Udon, and Seafood Tomato Cream Udon along with plenty of traditional options. Born in Gifu, Japan, Seiichi Kito opened Fugetsu-Do in 1903, making it one of the oldest still-running food establishments in Los Angeles. The Kito family was forced to liquidate their inventory during WWII before being sent to an internment camp in Heart Mountain, Wyoming. After their release, the War Relocation Authority tried to encourage the family to move to another location, but Seiichi and son Roy were set on returning to Little Tokyo and struggled to rebuild their business. They were finally about to reopen Fugetsu-Do on May 5, 1946. 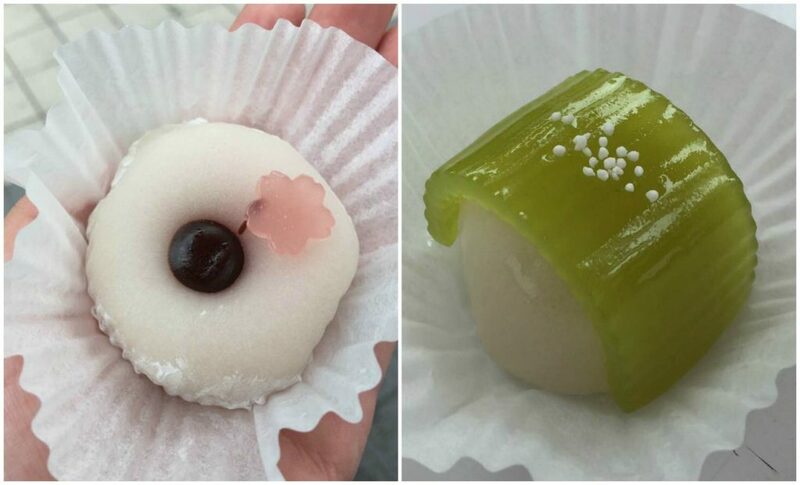 Today, the shop is run by Roy and Kazuko’s youngest child, Brian, and is well-known for their fresh mochi in a variety of traditional and modern flavors along with packaged products perfect for taking home to friends and family. 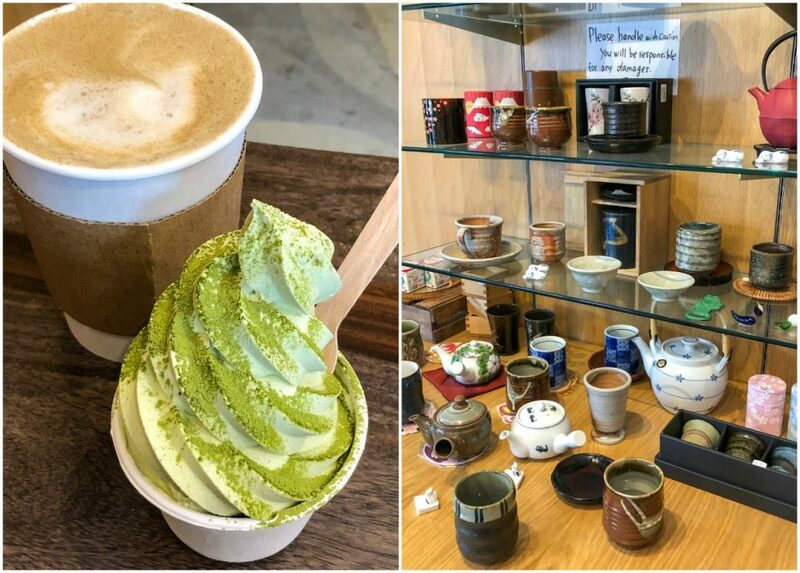 Hidden in a small shopping center on 450 E 2nd St, Tea Master Matcha Cafe & Green Tea Shop features green tea drinks and soft-serve ice cream. Focusing on a small menu, everything I have tried has been incredible. They also sell a handful of tea-related household items and snacks. 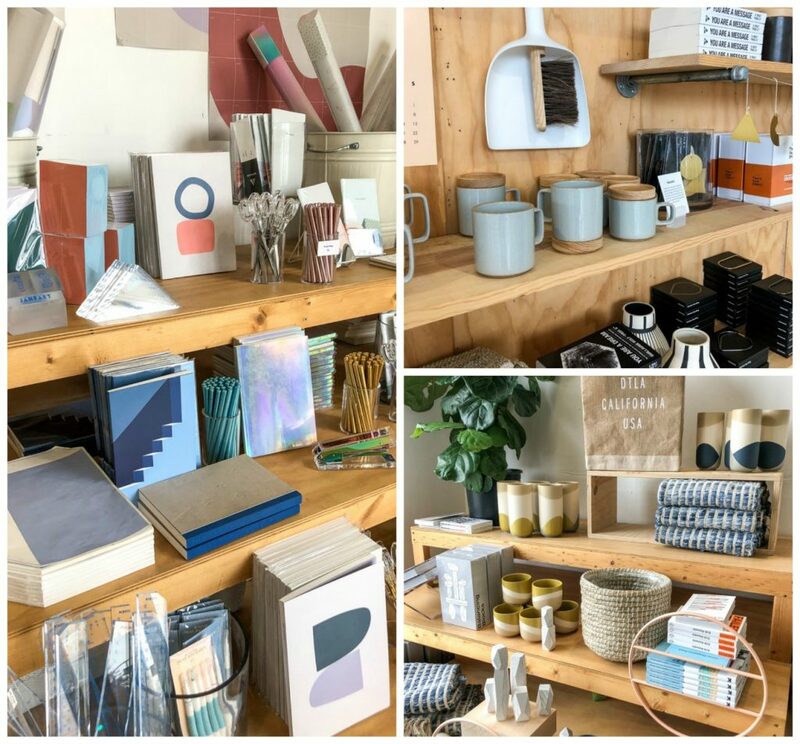 Found at the corner of E 2nd St and S Central Ave, Poketo features stationery, home items, jewelry, kitchenware, and other specialty products in a beautifully decorated space. Located at 358 E 2nd St near Poketo, Bicycle Coffee Co (based in Oakland, CA) opened in Little Tokyo early last year. The section for kids was a nice surprise with markers, paper, small toys, and a mini table with chairs. The Friendship Knot at the entrance to Weller Court was created by Shinkichi Tajiri. 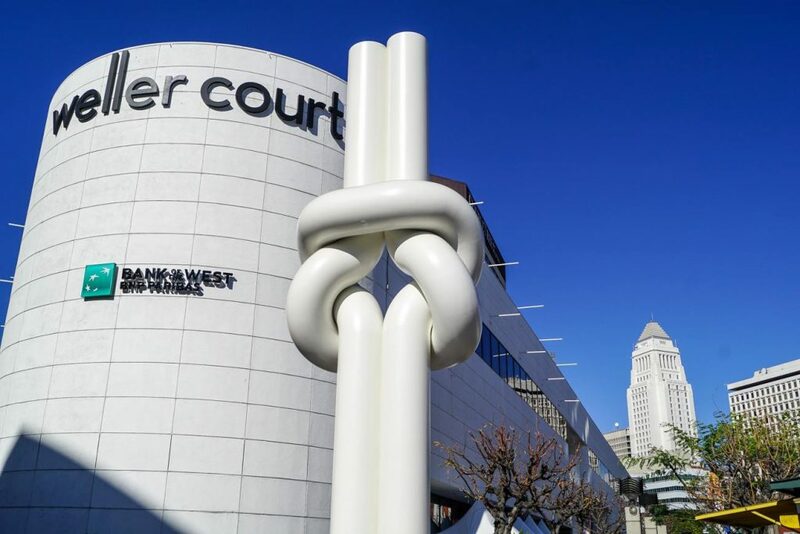 Originally located at his home in the Netherlands and called the Square Knot, the sculpture was shipped to Los Angeles and dedicated on August 5, 1981. The memorial for Ellison Shoji Onizuka stands on Onizuka Street by Midori Matcha. 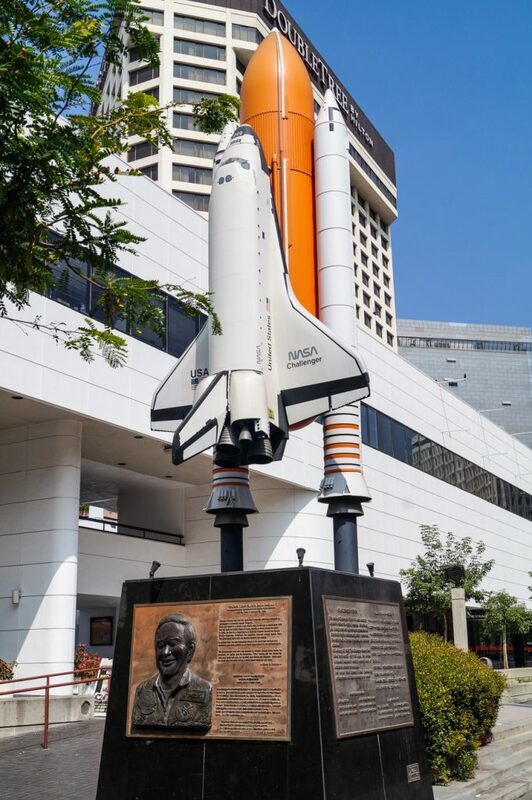 Born in Kealakekua, Hawaii, Onizuka was the first Asian-American/Japanese-American/Hawaiian astronaut in space with the launch of the space shuttle Discovery on January 24, 1985. He died at the age of 39 on his second space flight during the destruction of the space shuttle Challenger on January 28th, 1986. 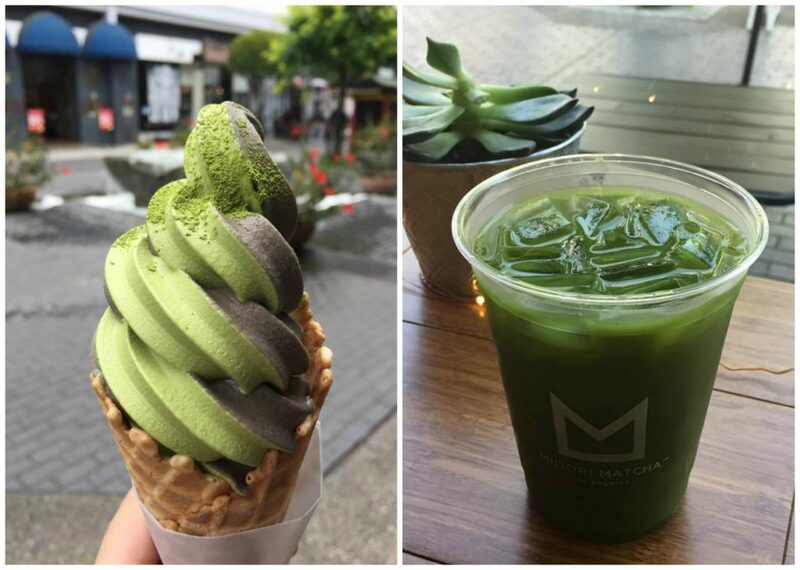 Midori Matcha is a fairly new addition to Little Tokyo. Opened in 2017, there are also locations in Pasadena and Costa Mesa. They serve organic Japanese ceremonial grade matcha tea and desserts. I especially loved the soft serve matcha and black sesame swirl. I first came across Kinokuniya while in New York City and was so excited to find one in Los Angeles. 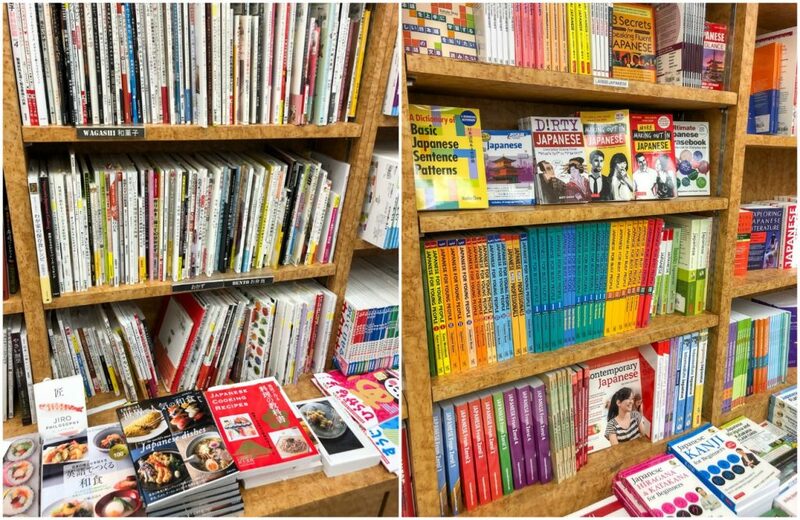 This location in Little Tokyo has a wonderful collection of Japanese cookbooks along with stationery, children’s books, crafts, gifts, travel, and Japanese language books (plus plenty for Korean, Tagalog, and more). We stopped by Curry House for a quick lunch during Oshogatsu. They feature everything Japanese curry with omuraisu (omelet with rice), noodles, seafood, curry doria, stone grilled curries, and plenty of toppings. Kid’s meals include katsu, spaghetti, meatballs, and teriyaki chicken plus coloring pages and crayons (they feature artwork by the bathroom). 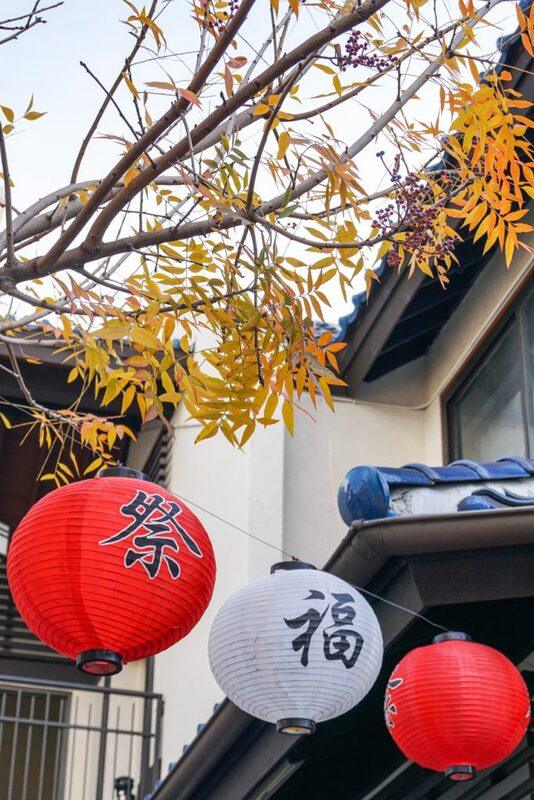 We started 2019 with an Oshogatsu celebration in Little Tokyo. The festival featured booths, street food, and entertainment throughout the day in Weller Court and Japanese Village Plaza. Highlights included the Taiko Drums, Sake Barrel Breaking, Shishimai (Lion Dance), Japanese folk music, Aikido, dancing, and a Kimono fashion show. For more information on events held throughout the year, check out this calendar. Nisei Week is one of the most popular and occurs in August. 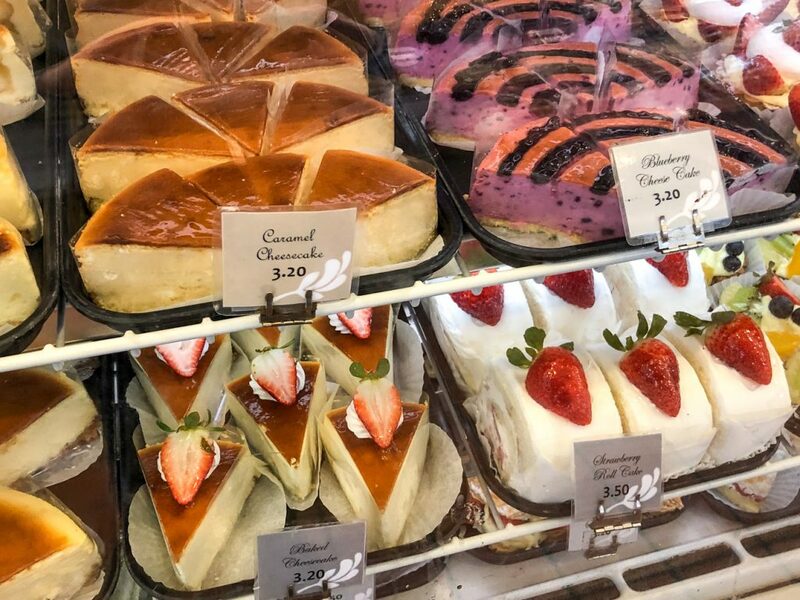 Yamazaki Bakery features a variety of bread, desserts, drinks, and other bakery treats. 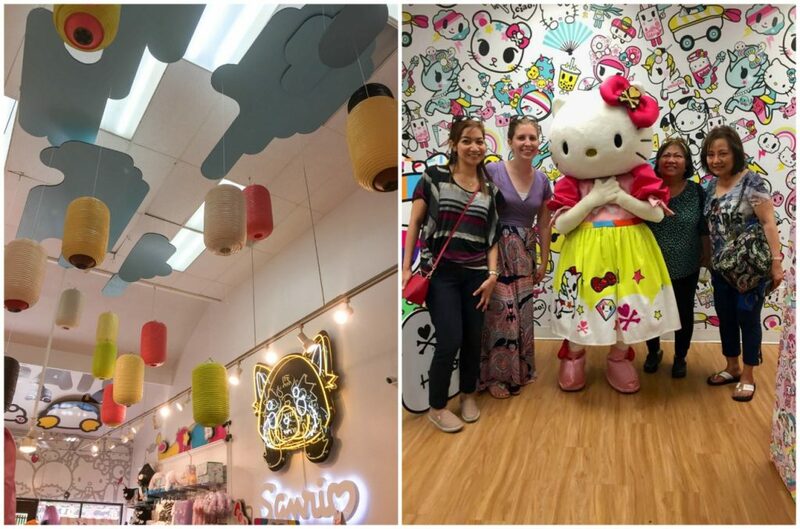 The Sanrio Store is filled with all things Hello Kitty and other Sanrio characters. You will find plenty of clothing, bags, toys, jewelry, bento products, accessories, and more. There are also events held throughout the year. ‘Lette Macarons first opened in Beverly Hills, but now has seven locations including one in Little Tokyo. I especially love the beautiful colors and assortment of flavors (photo above is the Sweet Wedding Almond/Almond Ganache). Mikawaya Mochi was founded in 1910 by Ryuzaburo Hashimoto as a traditional Japanese wagashi shop (Koroku and Haru Hashimoto were forced to close in 1942 and relocate to an internment camp in Poston, Arizona until the war’s end when they were finally able to reopen in 1945). 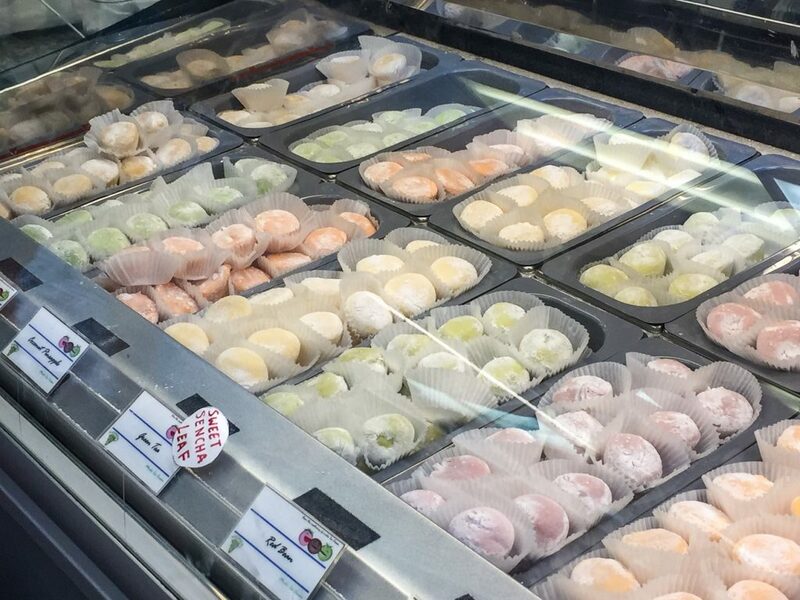 Owner Frances Hashimoto was actually the first to create Mochi ice cream (もちアイス, ice cream wrapped in a layer of soft and chewy mochi dough) in 1994 following an idea her husband had during a trip to Japan. Along with fresh mochi ice cream, you can also order ice cream on its own and other treats. Mikawaya’s mochi ice cream is now available in the freezer section of stores across the United States. I have not attempted it yet, but Nami of Just One Cookbook has a recipe to make your own. 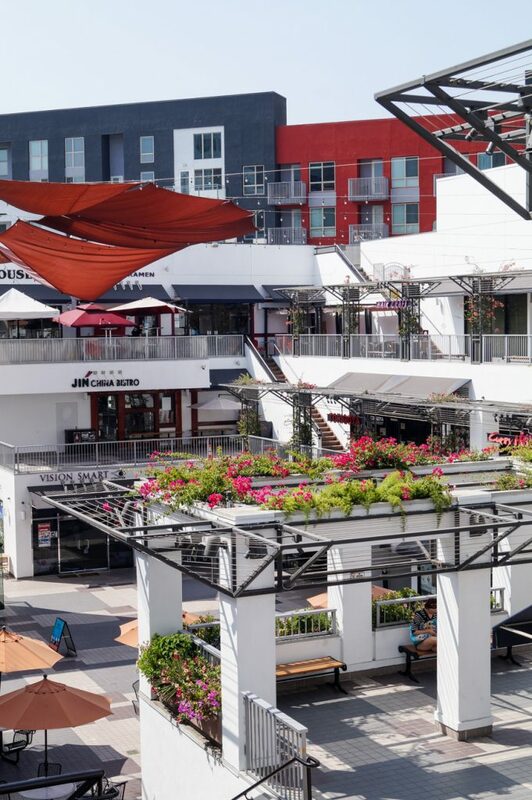 We often get to Little Tokyo early on Sunday mornings to avoid traffic and find easy parking. 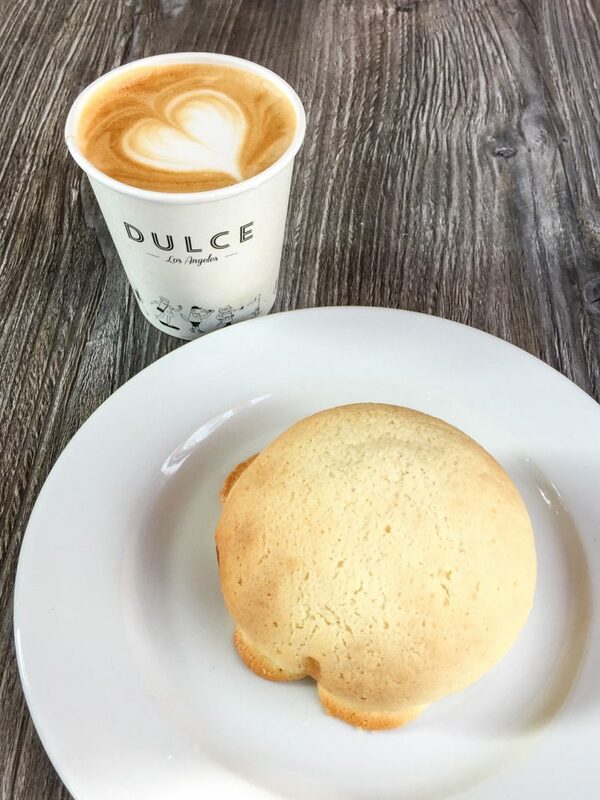 While most of the shops and restaurants don’t open until closer to noon, Cafe Dulce opens at 8 am and is usually our first stop for coffee and a pastry or two. The kids especially love the doughnuts. They also have a second location at 777 S Alameda St. Under the Japanese Village Plaza parking garage is a collection of shops featuring anime, cards, dvds, cosplay, and other related products. Chad and Evan always stop by Entertainment Hobby Shop Jungle when in the area. Here you will find anime, toys, games, collectibles, figurines, manga, stationery, J-POP, and more. Evan likes to look at all the “robots” while Claire enjoys the Funko Pop Disney characters. There are so many other notable spots in Little Tokyo in addition to what I have featured here including Nijiya Market (I haven’t actually stopped at this one since there is another location by my house in Torrance), Marukai Market (under Kinokuniya- I picked up a beautiful donabe here), James Irvine Japanese Garden (currently under renovation during 2019), Higashi Honganji Buddhist Temple, Jist, Bae, Milk + T, Mitsuru, and more. 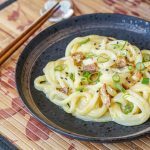 Inspired by Marugame Monzo, I was so excited to figure out how easy it is to make Miso Carbonara Udon at home. Now it isn’t quite as good as the restaurant’s without going to extra step of making the udon noodles by hand, but this dish is definitely still delicious and comes together quickly in less than 15 minutes. While a large pot of water comes to a boil, whisk together parmesan, cream, egg yolks, miso, and a little freshly ground black pepper in a medium bowl. In a wok, pan-fry 1/4 inch slices of bacon until crisp, drain the extra grease, add a little garlic, and deglaze the pan with some sake (this part is optional if you are avoiding alcohol). The udon noodles are boiled until just tender (this doesn’t take long at all, a minute or so), then tossed with the bacon and finally the egg miso mixture until thickened and creamy. Serve immediately with a sprinkling of green onions, more parmesan, and freshly ground black pepper. I didn’t add any salt since the miso and Parmesan had plenty to season the noodles. Adjust to taste as desired. Udon are long, thick noodles with a smooth and chewy texture. I use the frozen noodles found in the freezer section of Asian markets with Japanese ingredients and some larger supermarkets like Wegmans. The frozen noodles cook quickly in boiling water. You can also use dried Sanuki Udon, but frozen or homemade is best for this dish. Miso is a Japanese condiment created by fermenting soy with salt. Sometimes rice and barley are also used. There are many types of miso available. Lighter colored misos are usually more sweet and less salty. As the color darkens, the flavor generally becomes stronger and more salty. Unopened miso doesn’t expire. Once opened, refrigerate and use within a year. More information on Miso. 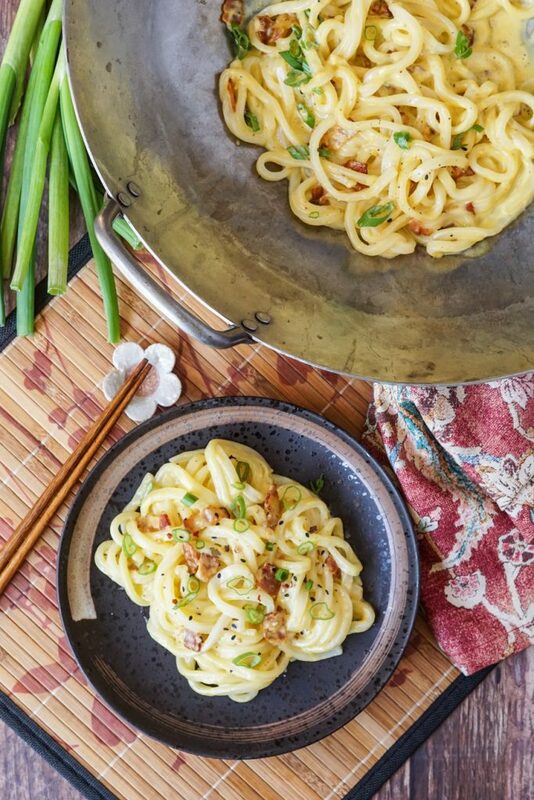 I used a white miso (shiro miso) in this Miso Carbonara Udon, but feel free to play around with your favorite or what you have on hand. Looking for more Udon recipes? Try my Niku Udon (Japanese Meat Udon), Chikara Udon (Japanese Power Udon), and Hiyashi Tanuki Udon (Japanese Chilled Raccoon Dog Udon). In a medium bowl, whisk together the parmesan, cream, egg yolks, miso, and black pepper until smooth. Bring a large pot of water to a boil. Add the udon bricks and cook until just tender. Drain and set aside. While the water is coming to a boil, drizzle olive oil in a wok or large pan over medium heat. Add the bacon strips and cook, stirring often, until the fat has rendered and the strips are crisp. Drain all but 2 tablespoons of the grease. Add the garlic and cook until just fragrant, 30 seconds to 1 minute. If using, pour in the sake to deglaze the pan and simmer until nearly evaporated. Toss in the tender udon until completely and remove from heat. Quickly toss in the egg yolk miso mixture until thickened and creamy. Serve immediately topped with thinly sliced green onions and an additional sprinkling of Parmesan and black pepper if desired. I grew up going to the j-town in SF, and lived in the j-town (more like block) in SJ as an adult. Was really cool reading your tour of the one in LA as I have never been. 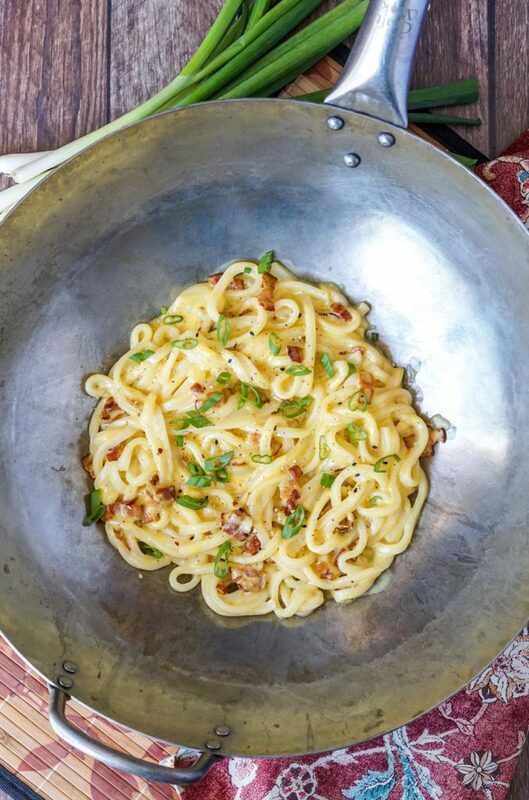 Love the creative take on carbonara! It was so good! San Francisco is definitely on the list while we are here in California. 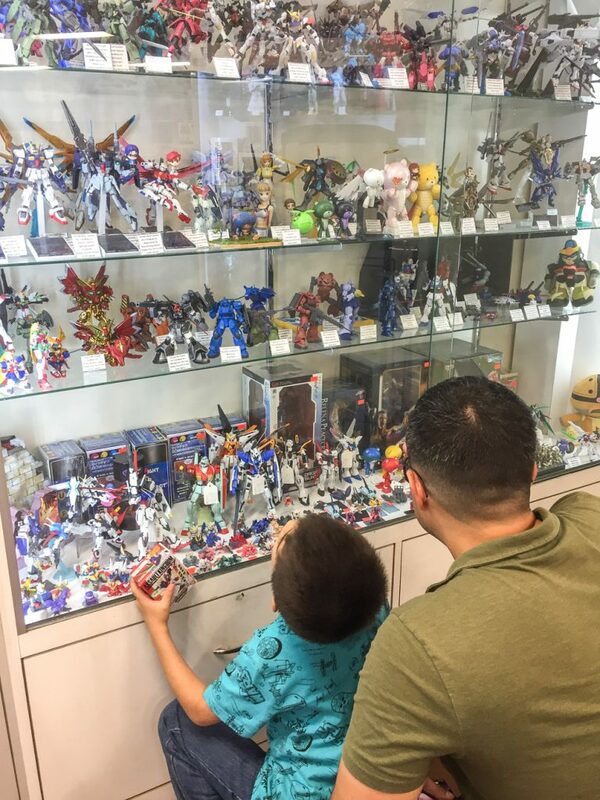 Thank you for the very thorough account of your visit to Little Tokyo! I’ll be visiting LA in a few months and have added Little Tokyo to my list. For the number of times I’ve gone to LA, it makes me sad that I’ve never visited this area nor tried the miso carbonara! What a great article. I have never been to Little Tokyo and you’ve really made it look and sound great! I only live 2 hours south of there and I want to make the trip. Those restaurants look really good too. My dad was born on 3rd street but a little way up from your area. Thanks for all the great information. So many great restaurants in the area! Carbonara with udon noodles?! 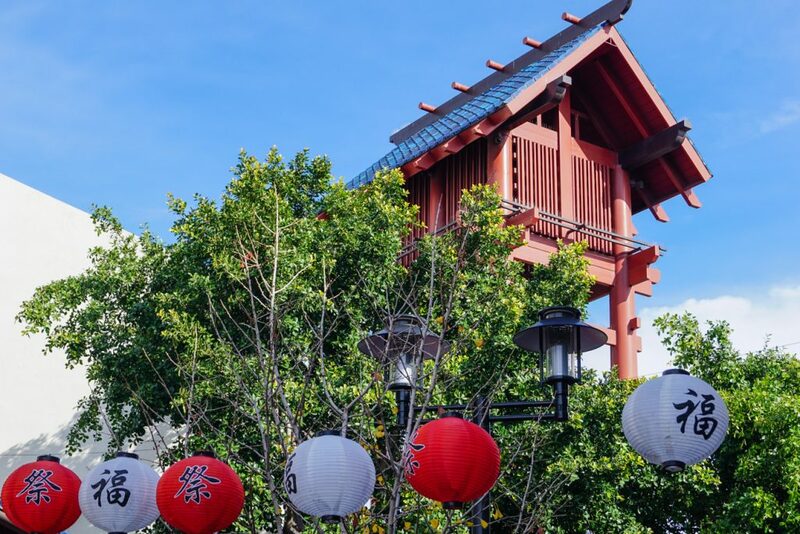 This is genius, I haven’t ever been to Little Tokyo, but we visit Chinatown in London a lot and we love it (my husband is Chinese) – I just love their cuisine. 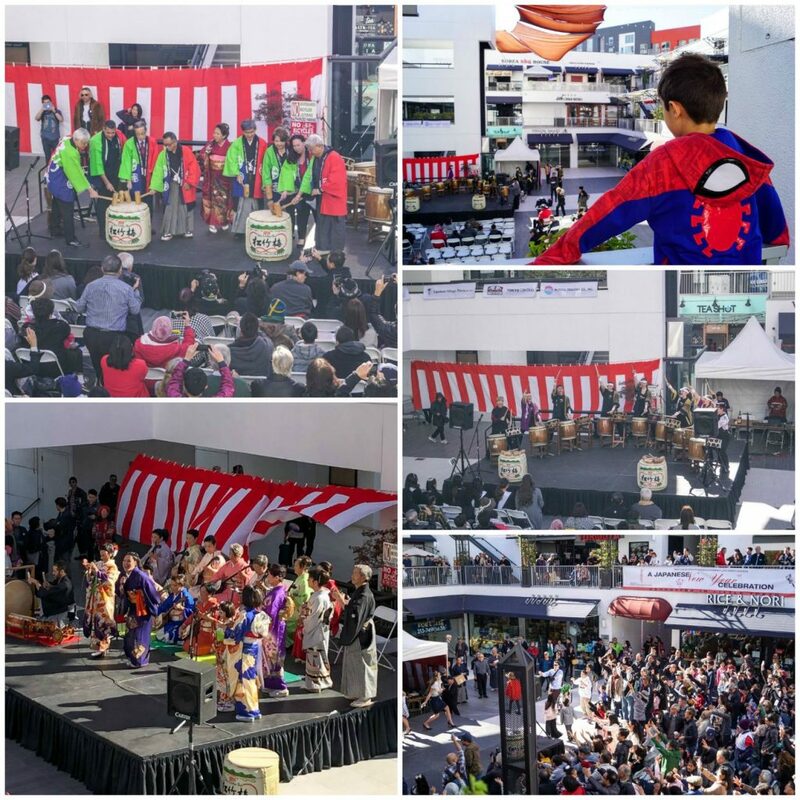 Little Tokyo looks like so much fun, what a great day out! 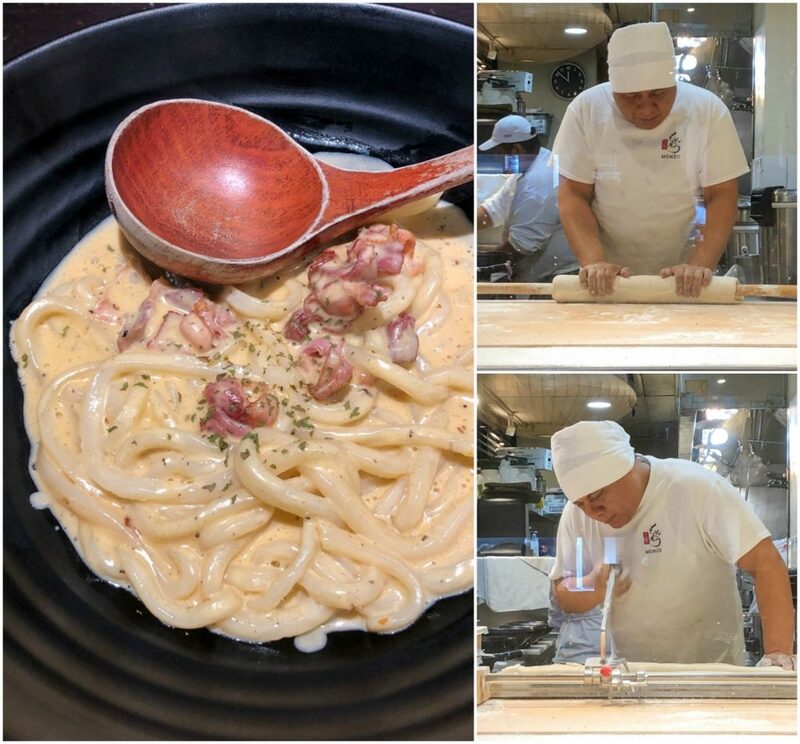 Very interesting and well documented item, thanks for the tour, would love to visit these restaurants as I’m very fond of Japanese gastronomy; Love the Japanese twist on carbonara! What an amazing post! You are opening my eyes to my own back yard! We have had such fun exploring!